Cyrtanthus contractus bursts into flower a few weeks after late winter fires, creating brilliant red splashes in the still-blackened veld. The large bulb produces a scarlet inflorescence with up to 10 tubular, hanging flowers which can be up to 8cm long, curved open at the mouth. The stems are mauve or sometimes red and the leaves only appear after flowering. They are common on road verges where they are protected from cattle damage. While you may be tempted, don’t dig them up on the side of the road. Besides being illegal to do this, they do not grow well in cultivation and seldom survive. Simply admire and enjoy them in their natural habitat. Cyrtanthus belongs to the family Amaryllidaceae and about 60 different species are found all over South Africa. Commonly known garden varieties are the George Lily and the Ifafa Lily, both very rewarding. Traditionally, bulb infusions are used as sprinkling charms against storms and evil. Children use the hollow stems as whistles. 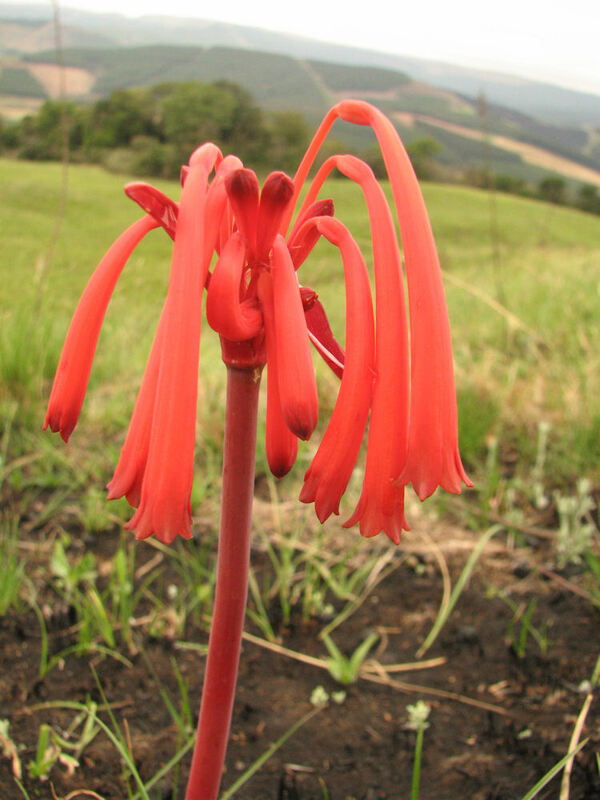 This entry was posted in KZN Midlands Wildflower and tagged cyrtanthus on October 14, 2013 by Midlands Conservancies Forum. Lovely unassuming but beautiful floral gem! Hi Nikki. This fire lily is Cyrtanthus brachyscyphus. Cyrtanthus contractus, which is common around Pmburg after fires has a more orange flower tube which flares open at the end. This picture shows a flower with a more reddish tube that doesn’t flare out so dramatically. Despite the map in the book it does occur in the Midlands and I have also seen it on Beacon Hill. Cyrtanthus brachyscyphus also flowers a little later than contractus. Beautiful photo. The Cyrtanthus are very hard for me. C. brachyscyphus is only known from Northern KZN, short tubes near water and on rock ledges a/c to Polley. Does not seem to fit. C. contractus, on the other hand, has very flared lobes in Pooley’s picture. So I cannot rule out C. tuckii transvaalensis which has narrower lobes but red tips . No iSpot observations of C. contractus. Needs more research. I await an opinion of someone who knows more that I do. Thank you for your observations, Peter. Oh wow, at long last I know what these lilies are called. They grow in abundance here in the Newcastle veld and often see thembthis time of the year when im out walking my dogs. They are blooming now. I’ve longed to know what they are called, now I know.